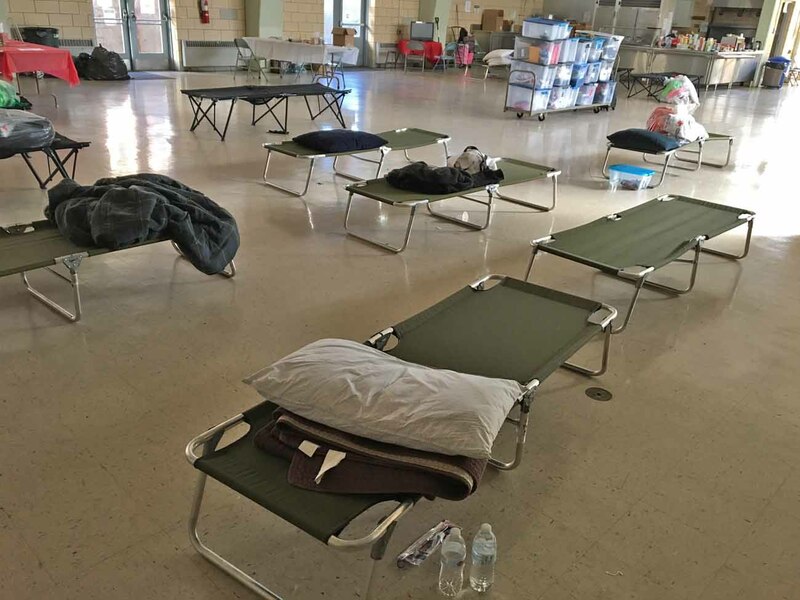 Beds and supplies are all set and ready to receive guests who need a warm place to stay on cold winter nights, thanks the Cold Blue program offered by Ann’s Heart in Phoenixville. When parishes merge, which is a fairly common event in this generation, what happens to the buildings of the parish that was absorbed? Are they a liability to be sold as quickly and profitably as possible or are they an opportunity? 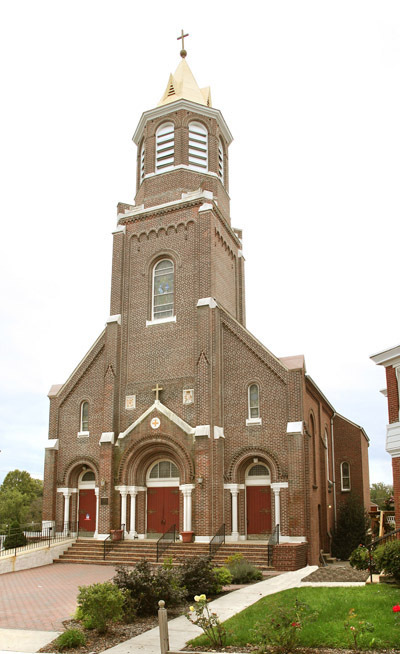 In Phoenixville when St. Ann Parish and Sacred Heart Parish merged in 2012 at St. Ann, a committee formed by Father John Newns, the pastor of St. Ann, opted to see it as an opportunity. First of all, Sacred Heart hasn’t disappeared. The church still hosts Saturday evening liturgies, weddings and funerals. And its buildings, including a rectory and school, are perfectly usable. Phoenixville itself, once a bustling steel mill town with roots tracing back to the 1730s, is hardly in decline. Like most of Chester County it is growing and thriving. The work of the committee was to discover ways the Sacred Heart buildings could be used for the benefit of the parish and the community as a whole. The final decision was to form a nonprofit organization independent of the parish but reflecting the values of the parish and the community to work for the common good. Sacred Heart Church, a worship site of St. Ann Parish in Phoenixville after their 2012 merger at St. Ann’s, houses the Ann’s Heart ministry in the church’s basement hall. This new entity was called Ann’s Heart, a play on the names of the founding parishes. Father Newns is a board member. “We work with the larger faith-based community and the secular community,” said Kristen McGee, a St. Ann parishioner who was part of the initial committee and is now the executive director of Ann’s Heart. The first task was to identify and offer needed social services not readily available in the Phoenixville area, which was within their ability to fulfill. The first outreach program was the Code Blue Overnight Emergency Warming Center. It operates in the cold season, basically Nov. 15 to April 15. It is not a residential shelter, it is a place where people can come in from the cold for the night when most public places such as libraries, stores and laundromats are closed. At this time the space used is the former parish hall under Sacred Heart Church, and it can accommodate in an emergency 16 people but more often it is 12 to 14. Those who utilize it are for the most part men, but some women too. Only in an emergency does it accept families, because it really isn’t set up to accommodate children. In such cases when that need comes up Ann’s Heart inquires with other agencies that can take families. Although Ann’s Heart would like to take in more people, the practical matter of fire codes and other restrictions does not make it possible under the present setup. Who uses the service? It might be individuals who were evicted, or had a home fire, or people who work at too low a wage to afford housing. It could be persons with mental illnesses or coming off addictions, any number of issues. “It’s a fair mix of people who have experienced a hiccup in their life and can’t afford housing,” McGee said. More recently Ann’s Heart has installed shower and laundry facilities, really basic needs for those who are trying to reintegrate with society. To meet expenses Ann’s Heart relies mainly on donations and grants especially from local businesses. Donations may be in kind, for example paper goods or toiletries. It is not simply a St. Ann Parish effort. Board members, volunteers and donors come from a number of neighboring Protestant and Catholic churches and a Jewish synagogue. Most of the overnight staffing is volunteer except for four paid rotating shift captains. More immediate future plans include a possible full-time emergency family shelter that would operate year-round. Probably the most involved of other faith-based partners with Ann’s Heart is St. Peter Episcopal Church, across the street from Ann’s Heart. St. Peter’s already offers a lunch program on weekdays and some Saturdays, with the various denominations including St. Ann’s supplying the food and volunteers on a specific day on a rotating basis. Rev. Dennis Coleman, a deacon at St. Peter’s and active with the lunch program, is also the president of Ann’s Heart. “It’s exciting, we have identified the need and we have the church hall and school available to us,” he said. “We have been flying while building the plane. We are thinking about a hospitality center where people can drop in. They could have lunch at St. Peter’s then go to Sacred Heart for the hospitality center. The hook is we get them at the lunch program and send them there. 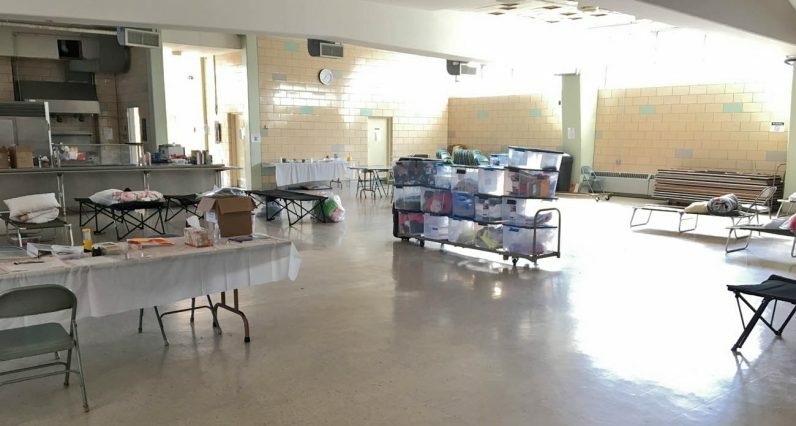 The Sacred Heart church basement hall has a kitchen facility and plenty of room for supplies and cots for Ann’s Heart to accommodate the 12 to 14 people, mostly men, who use the shelter — and potentially many more. That picture above is not the church basement, but it is the lower level of the adjacent and former Sacred Heart School. That was our cafeteria – spending five years of my childhood eating weekday lunch in there. Who can forget that room built with shiny yellow bricks?! Nice to see it again – brings back some distant memories! 50 years ago – it was lined with tables and chairs. Volunteer women would be cooking lunch behind the food line, shown on the left. To the right was where you would buy ice cream for dessert. Lunch was like 15 cents and a full meal! At one table is where all of the nuns sat for their lunch and the rest of us were scattered around the room, I think, by grade. We also had our school photos taken in there…..and a Christmas program every year before Christmas vacation. Msgr. John Senglar was pastor there, Fr. Francis Lendacki assistant. 1st. grade – Sister George Ann, 2nd grade – Sister Lorraine; 3rd grade – Mrs. Elenchin, 4th grade – Sister Hillary (who was mean). Then I left to go to public school. Wow a long time ago that was – 1966 -71. How times have changed. Thanks for the memory.